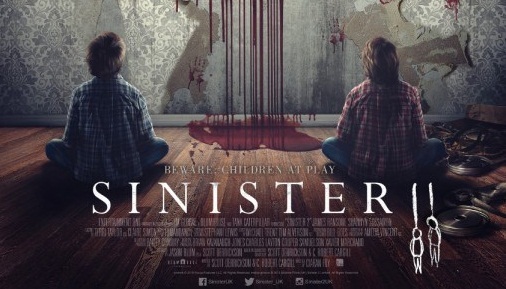 Since I like horror movies so much, I thought I’d see what Sinister 2 is like… and I actually found myself enjoying it more than I thought I would. It was interesting to see that there were different murders detailed in this movie and evidence of them happening long before the few that were shown in the first movie. Many of the murders were much more gory and disturbing in this movie, though. I found it interesting to see that the movie focused primarily on what was happening to Dylan, one of the children, rather than just on what one of the adults was seeing. It was also good to see that his family situation had quite a lot of depth to it. I felt a lot of sympathy for him and his mother… but I had a really strong dislike for Zach. He didn’t seem to have much going on beneath the surface, while his brother (twin?) came across as much more sensitive. Not to mention kind. It was really cool to see Detective So-and-So in this movie. I felt he came across as a really strong character and that he seemed to be really brave… a hero I can really get behind. Plus, there were some very amusing things that he came out with. It would have been good to find out what his actual name was, though. And I did think he and Courtney had some real chemistry between them. While there were a lot of disturbing scenes in this movie, I didn’t find myself as scared by it as I was the first one. The jumpy scares, which the film relied heavily on, wore out their effect after a while. There were some good elements of foreshadowing towards the beginning of the film. There wasn’t much of an air of mystery, but there were quite a few elements of tension. Plus, it was good to be able to get to know the characters during parts of the movie as well. I have some mixed feelings about the ending. There’s the whole final scare thing used… but it would be nice for a horror film to have a proper ending every once in a while.